Over the next two weeks, we have some holidays and the opportunity to create feasts with new flavors. This most elegant recipe is from Andrew Wong and his book A. Wong The Cookbook. Xinjiang is a province in the far northwest of China, huge in area with 1.6 million square mile and very distant from the seacoast and the seafood we associate with Chinese food. Xinjiang shares a border eight different countries: Russia, Mongolia, Kazakhstan, Kyrgyzstan, Tajikistan, Afghanistan, Pakistan, and India. The population is heavily Muslim, so pork is not commonly eaten. The land does afford grazing areas for sheep and goats. You’ve had ribs: beef and possibly pork. But lamb ribs? Unlikely. Yet this recipe may be just the one to tip you over the edge. Go ahead. Get the ribs. Get the spices. Take this rib challenge from a master of Chinese cuisine. 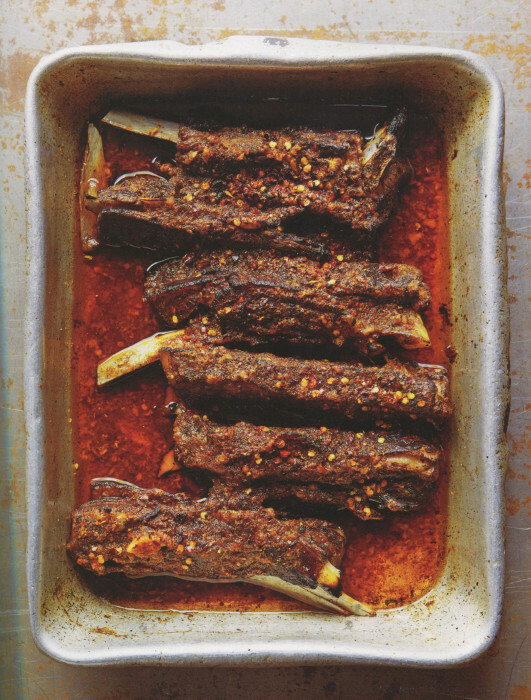 Place the ribs in a nonreactive baking dish and add the vinegar and spice mix, rubbing it vigorously into the meat. Cover and let marinate in the refrigerator for 2 hours. Cover the ribs with the fat (or oil) and cook in the oven for 2 hours or until the meat becomes tender and begins to fall off of the bone. Remove from the oven and let the ribs cool in the fat. When you are ready to serve, remove the ribs from the fat and, using a chef’s torch, char the outside of the ribs, rendering down the fat (basically simulating a barbecue). Sprinkle with more spice mix, the chile flakes, and the ground Sichuan pepper before serving. Place all the ingredients in a spice grinder and grind to a fine powder. Store in an airtight container in a cool, dry place for up to one month.